Local farmworkers are pushing for a ban on a toxic pesticide commonly used in Ventura County and discussed healthier pesticide alternatives during an event in Camarillo. About two dozen Ventura County residents attended the Thursday gathering, “A Call to Action: Alternatives to Pesticides Now,” which was held at The Abundant Table organic farm. Thursday’s event was focused on the dangers of chlorpyrifos, a pesticide that is commonly used on farms throughout the world, including many in Ventura County. Although regularly used by many major farms both locally and internationally, chlorpyrifos is deemed moderately hazardous by the World Health Organization and has potential to harm humans. Ventura County’s reliance on agriculture means that using pesticides such as chlorpyrifos can cause harm to the community, according to Olga Medina, a member of Lideres Campesinas, an organization that empowers women in agriculture. Medina, whose father succumbed to a stomach cancer linked to working with chlorpyrifos, spoke at Thursday’s event and said farmworkers needed to emphasize the danger toxic pesticides could have on families that live in close proximity to farms. Thursday’s speakers and attendees alike agreed that one of the most effective ways to combat chlorpyrifos is to support smaller organic farms such as The Abundant Table, which does not use pesticides. Jars of ladybugs and other beneficial insects were propped up on tables during the event, while informational graphics about organic farming dotted the rest of The Abundant Table’s gathering area. Instead of spraying crops with pesticides that can cause long-term damage to plants and humans, speakers argued that biodiversity — planting a variety of crops to ease pressure on the soil — and letting bees pollinate farms were far more sustainable than using toxic substances. 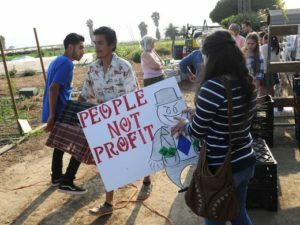 As the federal government declined to ban chlorpyrifos, which is produced by Dow Chemical, last year, it’s important to work with politicians on a local level to ban the substance or promote more organic pest management methods, said Adam Vega, a pesticide community organizer for Central Coast Alliance United for a Sustainable Economy (CAUSE) which put together Thursday’s event. Over 20,000 pounds of chlorpyrifos were used on crops throughout Ventura County in 2016, the vast majority on lemons, according to the most recent data from the California Department of Pesticide Regulation. The report noted that 902,575 pounds of the pesticide were used throughout California that year. The Environmental Protection Agency released a report in 2015 detailing chlorpyrifos’ health risks to children and farmworkers, which caused the administration of then-President Barack Obama to propose a ban on the pesticide. That decision was reversed under the Trump administration in March 2017 when then-EPA Administrator Scott Pruitt released a statement arguing that the science around chlorpyrifos required further study. MORE: Will harvest machine make farmworkers obsolete? That said, there is already scientific proof that chlorpyrifos is harmful to humans, according to Florence Ramirez, an Oxnard-based author who attended Thursday’s event at The Abundant Table. She argued that using toxic pesticides such as chlorpyrifos can have wide-ranging ramifications for the environment and residents alike. California’s Office of Environmental Health Hazard Assessment has a tool to analyze communities that are disproportionally burdened by pollution. The tool, CalEnviroScreen, notes that pollution burdens such as pesticide use can negatively impact a region’s air quality. Several Oxnard neighborhoods had a pollution burden of 80 percent to 100 percent in the June 2018 CalEnviroScreen study, with higher percentiles representing a higher pollution burden. Other California regions with high pollution burdens include parts of Sacramento, San Francisco and large chunks of Los Angeles County. It’s critical for local farmers to transition to more environmentally friendly methods of pest management if agriculture is going to be a sustainable practice, said Ron Whitehurst, who owns the Ventura-based Rincon-Vitova Insectaries, which produces and distributes beneficial insects for organic farming. Whitehurst spoke at Thursday’s event and noted that although some farmers had taken steps to reduce their use of substances such as chlorpyrifos, the end goal was to completely eliminate all forms of toxic pesticide usage.